Objectives To assess risk factors associated with failure and bleeding in intrapleural fibrinolytic therapy (IPFT) for pleural effusions. Setting Two tertiary-care centres in North America. Participants We identified 237 cases that received IPFT for the treatment of pleural effusions. Data for 227 patients were compiled including demographics, investigations, radiological findings pretherapy and post-therapy and outcomes. Intervention Fibrinolytic therapy in the form of tissue plasminogen activator (t-PA) or streptokinase. Primary and secondary outcomes Success of therapy is defined as the presence of both clinical and radiological improvement leading to resolution. Failure was defined as persistence (ie, ineffective treatment) or complications requiring intervention from IPFT. Incidence of bleeding post-IPFT, identifying factors related to failure of therapy and bleeding. Results IPFT was used in 237 patients with pleural effusions; 163 with empyema/complicated parapneumonic effusions, 32 malignant effusions and 23 with haemothorax. Overall, resolution was achieved in 80% of our cases. Failure occurred in 46 (20%) cases. Multivariate analysis revealed that failure was associated with the presence of pleural thickening (>2 mm) on CT scan (p=0.0031, OR 3, 95% CI 1.46 to 6.57). Bleeding was not associated with any specific variable in our study (antiplatelet medications, p=0.08). Conclusions Pleural thickening on a CT scan was found to be associated with failure of IPFT. To describe the use of intrapleural fibrinolytic therapy. To study the factors associated with failure of therapy. To study the factors associated with bleeding postfibrinolytic therapy. The importance of image-guided placement of drains and CT scan assessment of the loculated collections. The ability to achieve a high success rate with fibrinolytic therapy in most cases. The association of pleural thickening >2 mm on a CT scan with failure of therapy. Presents a large volume of patients. Assessment of the effect was performed with CT scan imaging. It is a retrospective study with no comparison group and describes a heterogeneous group of patients. Tillet and Sherry9 first introduced fibrinolytic therapy in 1949 as a treatment for empyema/CPE. Fibrinolytic therapy was reintroduced by Bergh et al10 in 1977, using a more purified form of streptokinase. Since then, there have been many studies which support the use of fibrinolytic agents in empyema/CPE treatment, but these were small trials11–14 and case series15 with success rates ranging from 38% to 100%. A prospective randomised study conducted by Maskell et al16 found that streptokinase had no benefit in the treatment of empyema/CPE. In contrast, a Cochrane database review was conducted in 2009 to analyse all the randomised controlled trials in adults with empyema/CPE treated with intrapleural fibrinolytic agents via an intercostal chest drain. Seven studies were reviewed recruiting 761 participants. The author concluded that intrapleural fibrinolytic therapy (IPFT) confers significant benefit in reducing surgical requirement and has not been shown to significantly increase adverse events.17 However, they are still judged as underpowered to override present methods. The Cochrane review concluded that current evidence suggests that intrapleural fibrinolytics cannot be recommended as the standard treatment of parapneumonic effusion and Empyema.17 This conclusion was heavily based on Maskell's findings at the time. We performed a retrospective chart review of all cases that received IPFT during the period 1 January 2003 to 31 December 2010 at a tertiary care teaching hospital. Research approval from the Ottawa Hospital Research Ethics Board was granted (REB# 2010.563) and patients were identified using the pharmacy prescription codes and pharmacy records for intrapleural fibrinolytics at both campuses of the hospital. A clinical retrieval form was created that compiled data regarding demographics, clinical presentations, underlying diseases and comorbidities, investigations, radiological findings pretherapy and post-therapy, number of doses and type of IPFT used, as well as complications, interventions and clinical outcomes. Investigations that were taken into account included pleural fluid analysis and cultures, complete blood count and the coagulation profile taken before initiating fibrinolytic therapy as well as details on the radiological investigations performed, particularly CT scan findings, including the presence of a lung abscess, pleural thickening (defined as a pleural thickness more than 2 mm, ie, not a pleural plaque or due to pleural calcification or a malignant process), underlying lung disease as well as post-IPFT radiographic findings. The inclusion criteria were: all patients who received IPFT for complicated pleural effusions at our institute. This related to all effusions that failed to resolve by simple drainage over 24 h and included; patients with an infection-related effusion such as empyema (defined as frank pus or positive cultures); complicated parapneumonic effusions (CPE) (defined as loculated effusions with underlying lung infection based on both clinical and radiological evidence of active lung infections, ie, fever, productive cough with consolidation and loculations on the CT scan); patients who received IPFT for clotted haemothorax or had loculated malignant effusions (proven by fluid cytology). Our definitions of empyema/CPE are based on the culture and quality of the fluid produced as well as the CT findings, as opposed to Light's criteria that are cited in many studies. The standard therapy dose in our study was defined as 16 mg of t-PA or 250 000 IU of streptokinase. Both were diluted in 100 cc of normal saline and injected once a day through the chest drains, for three consecutive days. Fibrinolytic therapy was started 24–72 h after insertion of the pleural drains. t-PA is carried in our pharmacy as a 50 mg ampoule (t-PA, Roche, US$1350), dissolved in sterile water and placed in three syringes with 16 mg each, after which they are frozen and sent to the ward and thawed one syringe per day (box 1). The number of doses was chosen after consultation with the clinical pharmacist. Small-bore catheter is our preference (8–14 Fr catheter). More than one catheter can be used to help drain anatomically discrete loculations. 16 mg t-PA daily for 3 days. Flushing the small bore catheters with 20 cc of sterile normal saline solution. Clamp the catheter for 2 h after t-PA therapy. Apply −20 mm Hg suction over an underwater seal device. Daily chest x-ray as well as laboratory investigations (complete blood count, PTT/INR). CT scan of the chest on the 4th day. Appropriate antibiotic therapy when needed. A second course of 3-day t-PA therapy can be repeated if necessary. PTT, pro-thrombin time; INR, international normalisation ratio. As there was no standard t-PA dose recommended at the time, the approach was a practical one. Interventions were chosen by the treating physician at the time; clinical outcomes were defined and assessed by the treating team involved. Patients who received more or less than 16 mg/day were excluded from this study (n=3). The fibrinolytic therapy was given via the intrapleural catheter (8–14 Fr) or chest tube (28–32 Fr) that was placed by interventional radiology, respirology or thoracic surgery, after which the tube was clamped for 2 h and then unclamped and placed under suction of −20 cm water on an underwater seal device. All patients had daily chest x-rays and blood investigations. After receiving three doses, patients underwent a CT scan of the chest to document the effect of the treatment. A standardised treatment form for intrapleural fibrinolytics was used that detailed the aforementioned technique. All patients who presented with fever, positive sputum or pleural fluid cultures or a raised white blood cell count were also treated with antibiotics. Variables that were looked at in our study with regard to predicting failure included whether the loculated effusion was an empyema/CPE, clotted haemothorax or malignant effusion, as well as the presence of pleural thickening on a CT scan and associated parenchymal disease (lung abscess or necrotising pneumonia). Variables that were examined in predicting bleeding included whether the patient's international normalisation ratio (INR) was >1.4, pro-thrombin time (PTT) >40 s, platelets <80×103/ml and whether they were on prophylactic anticoagulation or complete anticoagulation (warfarin, intravenous heparin or dalteprine >100 U/kg/day) or whether they were using any antiplatelet medications (aspirin and naproxen), with clopidogrel (plavix) as a single unique variable. Definitions of success and failure were decided prior to data collection. Success in our study was defined as both clinical and radiological improvement, with radiological improvement being documented as the complete or near complete resolution of the effusion on CT imaging obtained after fibrinolytic therapy. Clinical parameters of success are defined as the resolution of symptoms of infection and pleural effusion (including dyspnoea, fever, pleuritic pain and raised white blood count) and do not require further intervention (other than pleural drainage). The clinical assessment of success was performed in an ongoing fashion by the treating team at the time and reviewed by the authors. Failure was defined as the failure to resolve loculated effusion or a complication necessitating intervention (specifically bleeding that necessitates fluid resuscitation and/or further intervention). Treatment outcomes were assessed by the investigators solely based on these definitions (ie, patients who were deemed clinically successful and averted decortication were not necessarily considered successful in this study). Follow-up was continued with a clinic appointment 3–6 weeks after discharge from the hospital with a chest x-ray. Statistical analysis consisted of univariate analysis of all variables (χ2 tests). All variables were treated as categorical. Variables with a p value of less than 0.05 were entered into a multivariate logistic regression model. All statistical analyses were performed with the use of SAS V.9.2 (Cary, North Carolina, USA). Through the pharmacy drug coding system we identified 257 patients that underwent IPFT between 2003 and 2010. 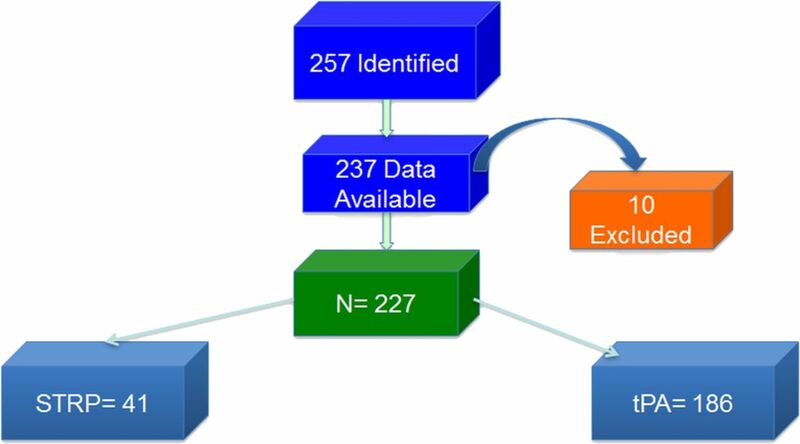 We retrieved data from 237 patients (20 patients had missing data). We excluded 10 patients from our study for the following reasons; 3 patients with alternative dosing regimes and 1 patient for each of the following reasons: instillation of therapy in a hiatal hernia sac, a chronic fibrothorax, a chronically ventilated patient with extensive lung disease, a chronic chylothorax, a bile leak after liver resection, a pancreatico-pleural fistula and a large necrotic malignant mass that was misinterpreted as empyema. The remaining patients (n=227) were included in our study (figure 1). Population studied. STPR, streptokinase; tPA, tissue plasminogen activator. Age range (mean)=17–94 (55) years. M:F=2:1. The mean age for our patient population was 55 years (range 17–94), with a male-to-female ratio of 2:1 (152:75. This included: 163 (72%) empyema/CPE, 23 (10%) haemothorax, 32 (14%) malignant effusions and 9 (4%) diagnostically undetermined (figure 2). Our patients received IPFT in the form of t-PA (n=186); however, earlier in this series, streptokinase was used (n=41). Of the 163 cases of empyema/CPE, 127 (78%) had positive cultures. The organisms cultured are represented in table 1. Clinically, apparent viscous effusion was noted in 66 (40%) of these patients. All patients with confirmed pleural infection were treated with antibiotics. Eleven of 23 haemothorax patients received antibiotics as well as 30/32 of the malignant effusions. In the 32 cases of malignant effusions, lung cancer was the commonest malignancy encountered with 14 cases (43.75%), followed by 4 cases of mesothelioma (12.5%), 3 cases of colon and breast cancer each (9.3%). The remainder included one each of the following: Hodgkin's lymphoma, chronic lymphoid leukaemia, osteosarcoma, Ewing's sarcoma, gastric cancer, renal cancer, oesophageal cancer and a malignant effusion of undetermined primary source. In acquiring access to the pleural cavity, we utilised 227 small-bore catheters (8–14 Fr), 75 chest tubes (28–32 Fr), 12 Pleurex (15.05 Fr) and 3 Malecot catheters (28 Fr) to administer the IPFT. Interventional radiology was involved in 119 (52.4%) of the cases, using fluoroscopy or ultrasound to position them. The remainders of the tubes were inserted by thoracic surgery, and respirology was performed at the bedside without imaging. However, since 2010, bedside ultrasound was utilised by these services for all their tube insertions. In most patients (51.1%), a single small-bore catheter was sufficient, while a single chest tube was used as the first-line drainage tube in 13.2% of the cases. Our overall success rate was 80% (181/227), while failure of the loculations to resolve occurred in 14% (33/227) of the cases, and in the remaining 6% (13/227), failure was due to bleeding from IPFT. Success was more frequent in empyema/CPE 85% (138/163) and haemothorax 83% (19/23) than in malignant effusions 59% (19/32). Success was associated with treating empyema/CPE (p=0.028) rather than haemothorax (p=.08) or malignant effusions (p=0.8) (table 2). In 80% of these successful cases, only 1–3 doses were required, with the remainder being successful within 6 doses. There were three cases that received more than six doses. These cases finally had complete resolution of their collections and the additional doses were mainly related to technical failures during the administration of the IPFT. Patients who received streptokinase had a success rate of 73.1% and those who received t-PA had a success rate of 81.2%. However, this was not statistically significant (χ2 test, p=0.37). A unique subgroup of our patients was patients who recently (between 7 and 14 days) underwent a thoracic operation and developed a loculated collection at the surgical site (n=24, 10%) and were treated with t-PA. These included 13 cases of lung malignancy (10 lobectomies, 2 wedge resections and 1 pneumonectomy with a loculated abscess) and 11 oesophageal cases (3 perforations and 8 esophagectomies for malignancy). The overall success of therapy in this subgroup was 83.4% (20/24). Two cases had failure of resolution of their collections and the other two developed a staple-line air leak and an oesophageal anastomotic leak. Complications occurring from therapy were varied; 44 (19%) of patients experienced some minor complication, with pain, as defined as an increase in the analgesic requirement, post-IPFT being the commonest (n=34, 15%). Other minor complications include shortness of breath requiring an increase in their oxygen requirement (n=8, 3.5%) and fever (>38 C) requiring antipyretics (n=6, 2.6%). These were all short-lived and resolved within 2 h of presentation. 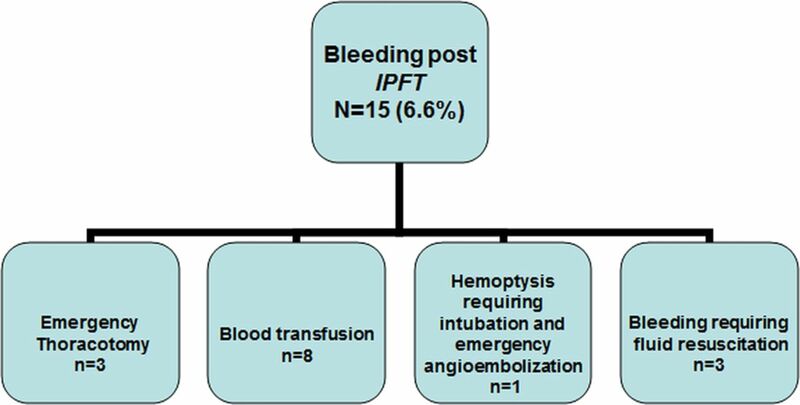 The major complication of IPFT was bleeding, which occurred in 15 patients (6.6%). Of these patients, more than half required blood transfusion of at least 1 unit of packed red blood cells (n=8). Three patients underwent an emergency thoracotomy to control the bleeding. One patient required intubation and urgent angio-embolisation with coils injected in the lateral thoracic artery and internal mammary artery branches. There was one mortality in our series (0.4%). This was an elderly patient who was admitted for a severe necrotising pneumonia of the right upper lobe with an associated empyema. His tube was inserted under radiological guidance, and after receiving his second dose of intrapleural t-PA, he started to deteriorate with frank bleeding from the chest tube. He was taken urgently to the operating room, which showed a severe necrotising infection with generalised parenchymal bleeding. This was controlled, but the patient suffered from severe irreversible hypoxic brain injury and died shortly afterwards. Failure of therapy was demonstrated in 46 (20%) cases, with 33 having failure of resolution of the effusion and 13 having complications. Of the 33 cases that failed to resolve after IPFT, 22 underwent a thoracotomy and decortication, 2 were managed by video-assisted thoracoscopic surgery (VATS), 3 required Claggett windows and 5 patients had no further treatment. Five of 227 (2.2%) patients did not have resolution of their symptoms, which were exclusively malignant effusions. In the last 3 years, only one patient in our institute had failed therapy and required an operative decortication. We used univariate and multivariate analysis to identify variables that were associated with failure of IPFT; these included malignant effusions, empyema/CPE and pleural thickening. After multivariate analysis was applied, pleural thickening, defined as pleural thickness >2 mm on CT scan, was statistically significant for failure of therapy (p=0.0031), and this was found to be almost three times more likely to predict failure of therapy (OR 3.1, 95% CI 1.46 to 6.57) (tables 3 and 4). Pleural thickening was noted in 119/227 (51.5%) patients overall. This included 84/163 (51.5%) of the empyema/CPE patients, 10/23 (43.5%) of the haemothorax patients and 20/32 (62.5%) of the malignant effusion cases, as well as 5/9 (55.5%) of the undiagnosed effusions. Empyema/CPE were found to have a p value of 0.041 for failure of therapy (OR 0.31, 95% CI 0.102 to 0.955). As for bleeding, univariate analysis showed a trend towards the use of antiplatelets, but this was not statistically significant (p=0.08; tables 5 and 6). The factors studied in the multivariate modules were complete for all patients except for the data relating to INR (215/237); the laboratory values collected included platelet count (468×103), INR (1.14) and PTT (29.3/s). We present a single institutional experience with IPFT for complicated pleural effusions over an 8-year period in 227 patients with different underlying pathologies. These patients represent all the cases of pleural effusion that did not respond to traditional treatment in the form of simple drainage and antibiotic therapy and had received IPFT. The majority of our population (72%, n=163) was due to infectious causes, with 17 of those cases having associated parenchymal disease including lung abscess, lung cavity or necrotising parenchymal infection. We report an overall success rate of 80%, with a success rate of 85% in patients with infectious causes. Different studies have demonstrated effective doses ranging from as low as 4 to 100 mg/day.11–21 In our study, we have used 16 mg/day, given as a single dose in standard therapy, for three consecutive days. This dose was chosen to simplify its dispensary from the pharmacy in frozen form as the ampoule contains 50 mg/ampoule and is utilised over 3 days. Although there were three cases that did not meet our defined standard dose criteria (they were less than 16 mg/day), they were successful but were excluded from our analysis. In our patients, only a few cases required more than three doses (20%). Although there is no standard clamping time for this therapy, we chose to use 2 h of clamping time for each dose. These issues (the optimal dose, the optimal frequency and the optimal clamping time) remain unresolved for IPFT. It is well known that the half-life of streptokinase is 15–30 min and the half-life of t-PA is 4–8 min.22 It would therefore be logical to allow a more frequent daily dosing, but that would require further clinical data to support. In our study, success was defined as both clinical and radiological improvement. Although CT volumetry of the effusions was not performed in our series, we considered the treatment to be successful if the effusion was completely drained or if the remainder was insignificant. This is difficult to quantify in these varied cases but goes well beyond the 50% or 60% reduction criteria, that is, cited in other studies as a definition of success.16 ,18 More importantly, we defined failure thus: failure of the effusion to resolve or if the patient required further intervention related to bleeding from the IPFT. We were able to demonstrate an overall success rate of 80% for all effusions, but this was lower for loculated malignant effusions (59%). This result was comparable to Thommi et al's20 study of 120 patients treated with t-PA for a variety of effusions (93 infections, 10 haemothorax and 17 malignant) who had an overall success rate of 85% with complete resolution, 8% unspecified partial resolution and 7% failed therapy. In Maskell et al's16 randomised study of streptokinase versus placebo, no significant difference was found between the two groups. Their therapy, however, was with tubes that were not radiologically guided and with no CT scan documentation of the effect of therapy. Failure of therapy in our study was 20% overall. An analysis of the variables associated with failure demonstrated that pleural thickening was the single most important variable in predicting failure of therapy. This probably reflects the chronicity of the disease, with collagen deposition and formation of a thick pleural peel. However, in 119 of our 227 patients, pleural thickening was present. Minor complications from the therapy were common, with pain being the commonest symptom encountered. Other minor complications included shortness of breath and fever, and in several instances, there was a combination of these symptoms. They were all short-lived (<2 h) and easily managed by antipyretics, analgesics and oxygen therapy. The most dreaded complication of IPFT is bleeding (figure 3). This occurred in 15 of our patients (6.6%), which is comparable to other studies.19–21 In 11 of these cases (73.3%), stopping the fibrinolytic therapy for 48 h resolved the symptoms, and we were able to complete therapy. Eight of those patients also required blood transfusion (2–4 units of packed red blood cells) for a significant and acute drop in their haemoglobin without haemodynamic instability. Bleeding occurred in the chest, whether intrapleural or extra-pleural or in the airway (haemoptysis). Three cases required emergency thoracotomy for bleeding post-IPFT, resulting in haemodynamic instability, of which one patient died (mortality 0.4%). We had 17 patients with severe parenchymal disease, either necrotising or associated with a lung abscess; of these, only 3 experienced haemoptysis. In most cases (7/15), the bleeding occurred after receiving the second or third dose of IPFT. Bleeding post-IPFT. IPFT, intrapleural fibrinolytic therapy. The incidence of bleeding post-IPFT in the literature ranges between 2% and 15%.19–21 In the MIST II trial,18 Rahman and Maskell report on five cases of bleeding, including two cases of intrapleural bleeding and one case of haemoptysis that occurred in the tPA and DNase arm (5.76%). Although we could not identify any specific variable in our study to be statistically associated with bleeding, we did note a trend towards the concomitant use of antiplatelet medication (aspirin and naproxen) with IPFT (p=0. 08), with 28% of our population receiving these medications. Our study has some limitations; it is a retrospective study with no comparison group and represents a heterogeneous group of patients with a selection bias. The selection bias encountered in our study group is related mainly to the fact that many are referred from other hospitals, services or other cities; therefore, they are usually of a later presentation. Also of note, there was a subgroup of patients that recently had major thoracic operations and developed infected collections that had fibrinolytic therapy administered. There is a paucity of data regarding the use of fibrinolytic therapy for this subset of patients. Our definitions of empyema/CPE are based on the culture and quality of the fluid produced as well as the CT findings, as opposed to Light's criteria that are cited in many studies. The authors would like to point out, however, that despite these limitations, we have adopted this therapy as a first-line treatment to all loculated effusions presenting to our surgical unit that have failed simple drainage. Although this study is retrospective and non-comparative, the data provided suggest that pleural thickening (>2 mm) on a CT scan is predictive of failure of therapy. Although bleeding has a low incidence, it is the most serious complication arising from fibrinolytic therapy.
. Resolution of pleural effusions. Chest 2001;119:1547–62.
. The incidence and clinical correlates of para-pneumonic effusions in pneumococcal pneumonia. Chest 1978;74:170–3.
. Pleural diseases. Philadelphia, PA: Lippincott, Williams & Wilkins, 2001;151–81.
. Effect of repeated thoracentesis on fluid characteristics, cytokines and fibrinolytic activity in malignant pleural effusion. Chest 2003;123:1188–95.
. The use of fibrinolytic agents in drainage of complicated fluid collections. Appl Radio 1998;27:43–9. Strange C, Allen ML, Harley R, et al. Intrapleural streptokinase in expiremental empyema. Am Rev Respir Dis 1993;147:962–6.
. Rational of treatment of empyema in children. Arch Surg 2000;135:907–13.
. Altaplase in the treatment of complicated pneumonic effusion. Chest 1990;90:852–6.
. The effect in patients with streptococcal fibrinolysis purulent, and sanguinous pleural exudations. J Clin invest 1949;28:173–90.
. Intra pleural strepto-kinase in the treatment of hemothorax and empyema. Scand J Cardiovasc Surg 1977;11:265–8.
. Randomised controlled trial of intrapleural streptokinase in community acquired pleural infection. Thorax 1997;52:416–21.
. Intrapleural urokinase versus normal saline in the treatment of complicated para-pneumonic effusions and empyema. Am J Respir Crit Care Med 1999;159:37–42.
. Intra pleural strepto-kinase versus urokinase in the treatment of complicated para-pneumonic effusions: prospective double-blind study. Am J Respir Crit Care Med 1997;155:291–5.
. Randomised trial of intrapleural urokinase in the treatment of childhood empyema. Thorax 2002;57:343–7.
. Intrapleural streptokinase for empyema and complicated parapneumonic effusions . Am J Respir Crit Care Med 2004;170:49–53.
. Controlled trial of intra pleural streptokinase for pleural infection. N Eng J Med 2005;352:865–74. Cameron RJ, Davies H. Intra-pleural fibrinolytic therapy versus conservative management in the treatment of adult parapneumonic effusions and Empyema. Cochrane Library 2009;3:1–42. et al. Intrapleural use of tissue plasminogen activator and DNase in pleural infection. N Engl J Med 2011;365:518–26.
. Intrapleural tissue plasminogen activator for complicated pleural effusions. J Trauma 2004;57:1178–83.
. Efficacy and safety of intrapleural instillation of Alteplase in the management of complicated pleural effusion or empyema. Am J Ther 2007;14:341–5.
. Recombinant tissue plasminogen activator in the treatment of pleural infections in adults. Respir Med 2008;102:1694–700. Activase (Alteplase, recombinant tissue plasminogen activator) prescribing information. South San Francisco, CA: Genentech, Inc. Revised 1999. Contributors SAD was the lead investigator and author. He provided input to the database. DEM was the co-author and investigator. AS was the primary research coordinator. He edited the manuscript and helped to plan the study and interpret the results. JI provided the statistical analysis. DA, CL, JT and VD provided input into our database. FS, SS, SG, JS and PJV helped to plan the study and interpret the results and provided critical feedback. All authors reviewed the results and analysis of the study. AS and DEM reviewed and edited the final manuscript. Ethics approval Ottawa Hospital Research Ethics Board (REB# 2010.563). Data sharing statement No additional data were available.